Executive pay is never far from the headlines. Last week, the Chief Executive of a British Housebuilding company walked out of an interview with a BBC journalist when asked about his bonus of £75M. His bonus had in fact been reduced from £110M after adverse publicity centred on the elevation in the company’s share price from the government’s Help to Buy scheme. He was one of three directors of the company to receive frankly eye watering bonuses this year, causing the generally understated Vince Cable MP to comment that it was “reminiscent of the worst excesses of corporate greed that helped to create the financial crisis, when short-termism was heavily incentivised and long-term planning ignored“. I was puzzled as to why he felt he needed £75M, let alone whether he deserved it. Windfall wealth does not appear to lead to great happiness in life. Certainly, if I worked on one of the building sites for that housebuilder, I might feel slightly aggrieved after several years of low or no pay increases. The reaction in the social care sector, where front line employees are traditionally poorly paid for such essential work, would be outrage if such a bonus was paid to a Chief Executive and rightfully so. 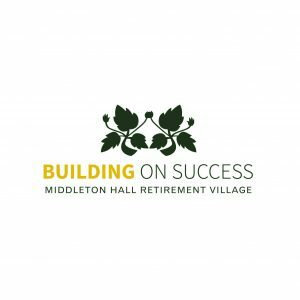 Thinking and planning for the long term is one of Middleton Hall’s underlying values and we have been carefully planning over the last few years how we can better share our success in the long term under a change of ownership. Owning a company like Middleton Hall has been a great privilege over the last 23 years, but it is unlikely I will still be leading it in another 23 years (in fact, I am more likely to be a customer at that point) and that has been a dilemma for me. Selling to a bigger company endangers the values and ethos that have helped Middleton Hall become the success that it is today. Even if that sale is to a caring, values driven organisation they in turn at some stage will be purchased by someone else. The social care market is littered with once caring businesses that are a shadow of their original owner’s ethos under a more profit driven direction. Because I do believe, business is not just about money. Particularly in social care. We have been very pleased therefore to announce how we will solve my ownership dilemma. In April 2019, I and the other shareholders will sell Middleton Hall to its employees. The company will become the first Employee Owned Retirement Village in the UK, based on the John Lewis model of an Employee Ownership Trust. I happen to believe our employees are the best people to ensure our success continues in the long term and certainly it will prevent any corporate greed as well as sharing rewards fairly. This entry was posted in Jeremy's Blog, News on October 26, 2018 by Jan. I found myself watching the Royal Wedding the weekend before last. I was not particularly planning to, but after an interesting debate at Middleton Hall’s Current Affairs discussion group about who should walk Meghan up the aisle (and if the idea of “giving away” the bride fits in modern Britain) I watched with interest. The modern thinking discussion group felt she should walk herself up the aisle and they were correct, with a little bit of Prince Charles helping out for the last bit. Two things stood out for me. 96-year-old Prince Philip walking confidently into church without so much as a walking stick, a month after a hip replacement. That shows the attitude needed to get to 96. And then of course, Rev Michael Curry’s address. Wow. I could hardly believe that I was watching a British Royal Wedding. Predictably, this week’s discussion group revealed a complete split on the appropriateness of the Bishop’s charismatic address and whether an American Bishop should even be preaching at a British wedding, but most agreed that it was a positive signal towards a modern, thinking Royal Family. For my part, I thought he was terrific and his message that the power of love could solve much in the world has real resonance in the times we live. Apart from families, communities and international relations all needing love it seems that the good bishop also thinks a bit of love would be good in business. I agree. Running a business is not all about money. The remarkably damning report that appeared in the week after the Royal Wedding from the Commons Select Committee about that the directors of Carillion “too busy stuffing their mouths with gold” while the company collapsed did nothing to improve the image of capitalism. Certainly, the report concluded that there was no love lost for their employees, customers or suppliers and showed nothing better than corporate greed. Rev Michael Curry is correct. Rather more love in business should avoid the sort of terrible examples that big company failures like BHS, BCCI, Enron and now Carillion set. Running Middleton Hall is of course very different from Carillion. It is a small, entrepreneurial company that aims to make a positive difference for people, so our values are inherent rather than being corporate platitudes. We work at Middleton Hall because we do care. Of course, a business that cares for people also brings huge responsibility. Sadly, even in social care there are some poor examples where the money is seen as the only priority and the wider social responsibility is forgotten as too many newspaper headlines have revealed. I doubt the residents in failing care homes experience the power of love that Rev Michael Curry had in mind. Whatever you may think of the appropriateness of the Most Reverend Michael Curry’s Royal Wedding sermon, the message was right. 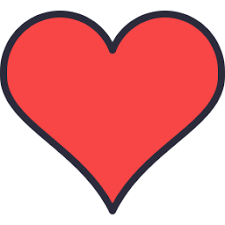 A bit more love in business could genuinely help capitalism improve its image. 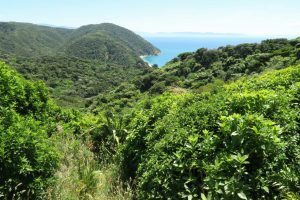 This entry was posted in Jeremy's Blog on May 31, 2018 by Jan.
Our sustainability group moved on last year from focus on our carbon footprint to our plastic footprint when they found some of the terrible facts about plastic. By 2050, at the current rate of progress, there will be more plastic by weight in the oceans than fish; one million plastic bottles produced every minute round the world being two such mind boggling numbers. The world (or at least the UK and Europe) does also appear to be waking up to the problem, mostly courtesy of Sir David Attenborough’s “Blue Planet II”. My admiration for him is only increased by how the series highlighted environmental issues. Our sustainability team has already made a dent in plastic use at Middleton Hall. Nothing to change the world but we all have to start somewhere. We now get our (organic) milk delivered in bulk and distributed by jugs, and the milk containers sold in the Orangery are good old fashioned returnable glass bottles. Well done Acorn Dairy for helping reduce our plastic containers by 500 a month. We have also held screenings of the excellent documentary “Plastic Ocean” in the Vision Room over the last couple of weeks. Some residents and staff emerged appropriately shocked at the latest human endeavour to mess up our planet. “Dreadful” said one resident “and I am certainly never eating mussels again”. I am not qualified to advise on how safe fish are to eat now, but it has certainly made me think again. Another excellent initiative from our sustainability group was to organise a voluntary litter pick. 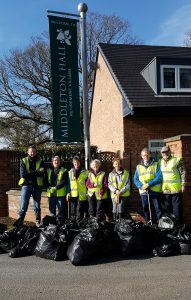 I was slightly sceptical that picking up litter along 300 metres of the country lane that leads to Middleton Hall would need an entire group. How wrong I was. I was genuinely shocked. All that in 300m of a low usage country road with no footpath. The UK has around 245,000 miles of roads. If our small road was just average, so that would be 28 million bags of litter sitting by our roads, if my O level maths is right. And I suspect that, as a high proportion of cars going along the road leading to the main Middleton Hall entrance are visitors and residents (and I cannot believe our customers would be lobbing empty cans of Carling out of their windows), our road might actually be below average. …according to the wise women of our Current Affairs Discussion Group last week, is to have all schools do a voluntary litter pick in a suitable location at least once a year and do their own maths on their findings. Some real education. (Credit to Dr Mani Mehta, Mrs Verna White, Mrs Ninette Mate, Mrs Sheila McGinn). Because we cannot keep on living like this. This entry was posted in Jeremy's Blog on April 5, 2018 by Jan. It is almost 22 years since I first stepped foot in Middleton Hall. Middleton Hall is a very different place in 2017 than it was on that life changing day in January 1996. It has been a quite extraordinary journey for me personally as well as the company since that time and I have to be honest in saying that 22 years of living Middleton Hall’s ups and downs has not always been easy. I do feel that I need a break, so I have taken the opportunity of an extended break. A sabbatical of sorts. With a little research built in. And perhaps Middleton Hall deserves a break from me! 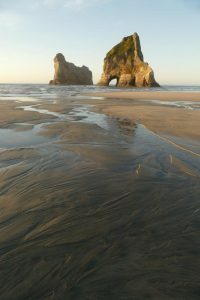 Hence this blog is being written from New Zealand. A country where retirement villages have ten times the market share of the UK and where retirement villages have existed and flourished for several decades. All this in a country that is slightly bigger than the UK in area but with 7% of the population and some utterly stunning scenery. In 2016 a group of leading Australian, New Zealand and British retirement village operators got together in London and it was clear we have plenty to learn in the UK. So, a little learning is on my agenda. Along with some walking, cycling, catching up with friends down under and the small matter of the Ashes. 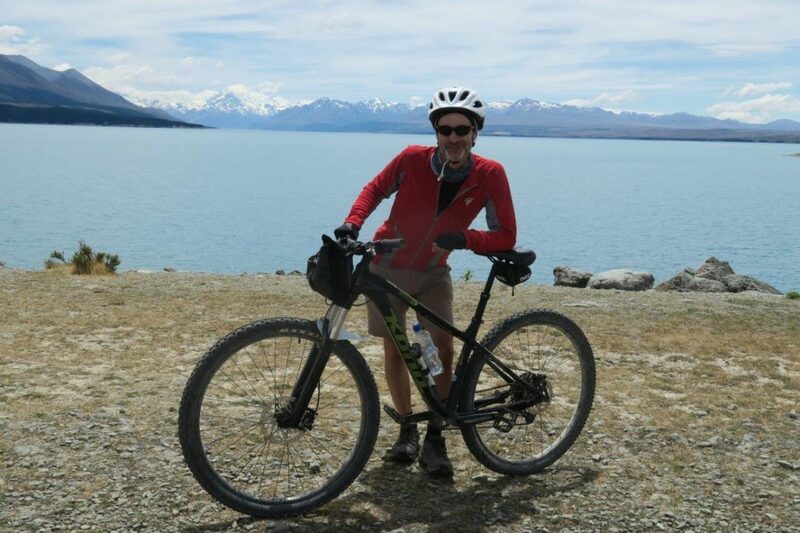 I am writing this after a day’s cycling in the South Island. Mount Cook is glowing in the evening sun, framed by the patio doors in our accommodation after being shrouded in cloud when we were near the base yesterday. I will avoid mentioning any problems with temperature as I read that Heathrow has been closed with snow and the forecast for parts of the UK is -12°C. Many of you know that one of my other passions in life, aside from Middleton Hall, is cricket. As I appear to have just about retired from playing it may be time to watch a little more cricket and the Boxing Day test match in Australia seems like a good place to start. It does however involve getting a flight from Auckland at 6am on Boxing Day morning to arrive for start of play in Melbourne. After watching England win the Ashes in Melbourne and Sydney (at least that Is the plan) and seeing some Australian retirement villages, I am switching 30°C for -25°C in the mountains of Japan’s north island. I am hoping that this should recharge my batteries and perhaps help chart the course for Middleton Hall over the next 22 years. Although we have accomplished a lot in 22 years, there are always opportunities to improve and part of this trip is about learning from successful equivalents working in a more mature market than the UK. Bring on the next chapter in Middleton Hall’s journey. With my very best Seasonal Greetings from Down Under. This entry was posted in Jeremy's Blog on December 13, 2017 by Jan. So we have a “snap election”. Some election bribes have been offered out (students clearly being part of Labour’s target market) and of course politicians on all sides are offering to throw money at the NHS. Briefly there appeared to be some space opening up in policy terms around social care, before the Conservative party rushed into a U turn after some newspapers used the dreaded “dementia tax” label. Amidst all this debate (some even focussing on policy rather than personality), it would be great to see courage and leadership shown about the problems in the NHS and Social Care. I fear this will not happen. Before the election announcement, the government announced a green paper on the future of social care. Yet another no doubt lengthy report that will follow the usual routine. Concerns will be raised about funding, government will feel discomfort about how to deal with the issues so end up playing for time – preferably so the next government will have to deal with it. The spectre of funding for social care has been stalking the corridors of different governments for over 10 years now and despite various Royal Commissions, Green Papers, White Papers and some actual laws nothing has really changed. The last attempt emanating from the Dilnot Commission produced the Care Act which included the infamous care cap. When the Department of Health finally realised the impact that it would have on the social care market as well as public funding, it was booted into the long grass until 2020 (conveniently after the next election was then due). And that has been the way of the last 10 or more years. Put it off. Preferably until someone else will have to deal with it. But neither the NHS nor social care industry can wait. More importantly, nor can older people trapped in hospital beds, in underfunded care homes or receiving inadequate care at home. Crisis is perhaps a rather overused term, but the social care crisis is now real. Middleton Hall is fortunate in having customers who recognise that they want quality and are prepared to pay for it. But that is only part of the market. Those who do not have that choice are being ill served by our political masters. History suggests that no government is really prepared to deal with the problem. And with a five year (or less when that is more convenient) election cycle, it is always too easy to find a way of putting it off. So let’s not have more reports or commissions. Let’s have some courage. Courage for a cross party agreement, not an election gimmick. Courage to face up to the uncomfortable truth. The truth that we can no longer afford to maintain either the NHS or social care without either accepting that many of us will have to pay more tax or many of us will have to pay for our care. So party leaders – how about some real leadership? Never mind the election gimmicks and whether someone has the right charisma or dress sense to be Prime Minister but how about someone prepared to speak the truth. We cannot have a low tax economy and high quality public services – especially with something as important as social and health care. No more vague promises or putting it off. Just be honest with we electors. This entry was posted in Jeremy's Blog on August 24, 2017 by admin. How do you measure success? Bottom line profit? Achieving targets? Company growth? Of course, financial results are incredibly important to all businesses but that is not really how I judge whether Middleton Hall is successful. If I ever have any doubts about success, I find going to a party a good test. I have recently attended three parties at Middleton Hall – our annual Fun Day, Middleton Court’s celebration of 10 years since opening and as a guest at the party that one of our Middleton Woods residents throws each year. My fellow director Lesley also enjoyed attending the Middleton Oaks summer party on Saturday. It is at those events that I really get a sense of what we are achieving at Middleton Hall. Many staff were involved in putting together the Fun Day (Wizard of Oz theme this year) with great creativity, huge enthusiasm, and a lot of hard work. Their efforts were rewarded with a large turnout and as one resident said to me “I don’t think I have ever seen so many smiling faces”. Middleton Court opened 10 years ago as a new facility for nursing care clients. I well remember several owners of nursing homes telling me it could never work with only 20 beds (and what on earth were we doing installing full en-suite shower rooms for nursing care?). Their considerably larger businesses were of course cost driven models and what they failed to realise is that there is an alternative quality driven model. Middleton Court was full within six weeks of opening in 2007 and has consistently received very high customer satisfaction. The party to celebrate its 10th anniversary was full of cheerful residents and families pleased that we have stuck with nursing care. Most of our doubters have since given up even providing nursing care. At the Middleton Woods private party that I was honoured to attend, there was a buzz around the restaurant and much jollity. I was telling some of my fellow guests about an incident not long after the first residents moved in ten years ago. I was at work late one night and walked past the bar around 10pm and heard some laughter coming from a group of residents sat in the bar following a meal in the restaurant. When I put my head round the door, one of them enquired if we did “lock-in’s”. Obviously, Middleton Hall would not condone out of hours drinking, but I did walk away delighted with the spirit (in both senses) of our pioneering new residents in 2007. Of course, we need to make good profits and achieve financial returns on the considerable investment made into the business to repay debt and reinvest for the future. However, as a retirement village, all that investment would not make any sense if we did not make a positive difference to the lives of our customers at Middleton Hall. So a good party is perhaps the real test of success at Middleton Hall. Although not any sort of rugby expert, I do enjoy watching Rugby Union. The Six Nations has been interesting this season – England’s winning run equalling the world record and Scotland appearing to provide serious opposition. Until they met England on Saturday at Twickenham that is. England have extended their winning run to 18 consecutive wins and if they beat Ireland next Saturday will have achieved back to back grand slams in the Six Nations. Interestingly though, for most of the Six Nations they have not actually played terribly well. In some matches they barely turned up for the first half. Despite that they keep winning, which is perhaps a sign of a good team. On Saturday, they managed to turn up for both halves and Scotland’s new found pride did not last long (nor that of their female counterparts after an equally uncomfortable encounter against the potential grand slam winning England Women). England suddenly looked like real champions. Comparisons with the New Zealand All Blacks may seem premature (beating the All Blacks is not, yet, part of their winning run). However, there are some parallels with the 2003 World Cup winning side. England won the 2003 World Cup for many reasons. One of those reasons was the drive, leadership and determination of captain (Martin Johnson) and the vision and planning of coach (Sir Clive Woodward). One of Clive’s catch phrases was “Getting Better Never Stops”. Having previously written about the All Blacks’ values in my blog, another Rugby/Middleton Hall comparison springs to mind. 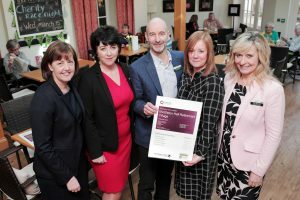 Last week, Middleton Hall Retirement Village was awarded the coveted “Outstanding” by CQC (Care Quality Commission) following a three day, unannounced inspection in January. Only 0.5% of care homes have achieved “Outstanding”. 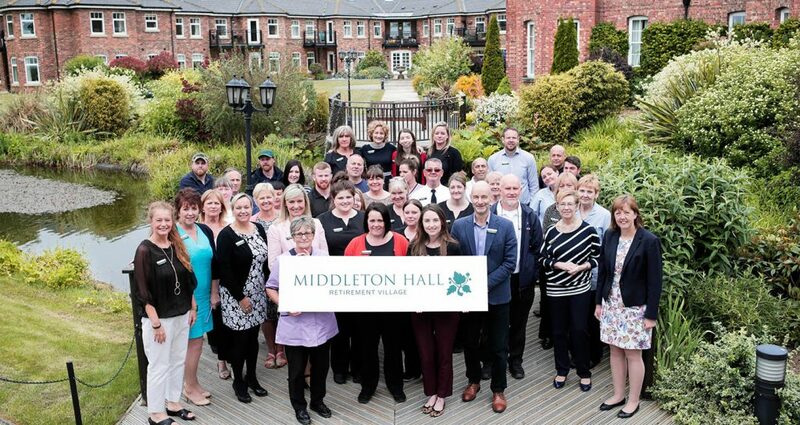 But Middleton Hall achieved something more impressive – our outstanding team achieved the very rare feat of being rated as outstanding in all five key areas of that CQC inspection. The Grand Slam of Outstanding. As a result, we received a visit from Debbie Westhead (Deputy Chief Inspector, CQC) last Thursday and also met Andrea Sutcliffe (Chief Inspector, CQC) at an awards dinner that evening. Both asked me how I felt about our outstanding achievement. I said that, in honesty, I had mixed feelings about it. Because I am worried that people might confuse this achievement with being the destination rather than a step on the journey. You see, I truly feel that Middleton Hall can improve much further and that we still have far more work to do. Sir Clive Woodward’s mantra is the point. Getting Better Never Stops. This entry was posted in Jeremy's Blog on March 13, 2017 by admin. The current affairs discussion group seems to be growing in popularity – we regularly have slightly more residents than can comfortably sit round a table these days. It remains broadly unpredictable however. I can rarely guess the topics that the group will choose to discuss each week. I normally select four or five potential topics from my favourite newspaper (BBC website) and the group choose one or two that they fancy having some intelligent debate about. Some topics are humorous. Some serious. Some seem both (Step forward Mr Trump. Ah. That’s no longer a joke). We recently took on the serious and relevant crisis in care to talk about. Nursing homes are closing every week and providers have started to pull out of home care contracts. These now include not for profit providers. When the not for profit sector cannot make care stack up, the government should pay attention. Middleton Hall and the top quality providers are generally not reliant on publicly funded clients, so are very fortunate. I am not going to blame local councils. 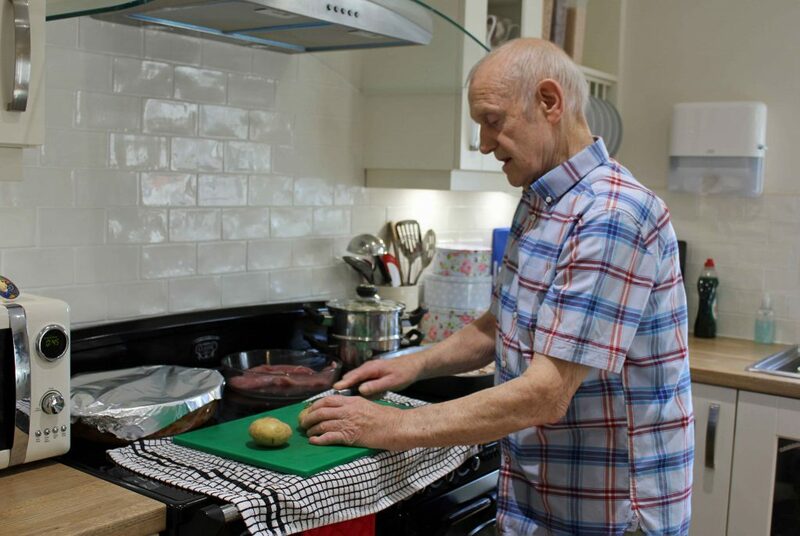 The simple fact is that they do not have enough money and with the advent of the so called National Living Wage increasing costs it is no surprise that 15 minute care visits at homes still exist and care providers are struggling. Of course, all this has an impact on the other rather large elephant in the room. The NHS. More elderly people ending up in hospital sometimes becoming “bed blockers”. Lack of social care resulting in more hospital admissions. When the NHS was created in 1948 (along with the origins of modern social care), hospitals put a few limbs in plaster and whipped out the odd appendix. Life expectancy was 66 for men and 71 for women. Medical care has got a great deal more complicated now and consequently a great deal more expensive. In 1948, the budget for drugs was £30M. It is now over £15B. We live in a different world now. Once we reach 65 we now have almost 20 years to live. Which means potentially 20 years not working or paying tax but increasingly using public services. Surely it is time to accept that we cannot sustain this. Which means many of us in the future will have to pay – for healthcare as well as social care. And yet, no political party is prepared to break for cover and admit that is what is needed. One member of the discussion group is a retired doctor. Even when she was still working, it was clear to her that a free for all NHS was no longer possible. The rest of the group all agreed that people would have to pay. But why do our political leaders refuse to raise the possibility? “It is not really voter friendly” concluded the group. And they were honest enough to admit they would be reluctant to vote for a party that proposed charging for the NHS. A slight element of turkeys voting for Christmas perhaps. But surely it is time to be realistic. The current system is clearly unsustainable. So how about some political honesty in at least talking about the reality – and the long term solutions? The Care Act was never going to solve the problem, but of course was a vote winner for retired people believing they would not lose their savings paying for care and for their families thinking their inheritance was safe. The current generation of baby boomers is wealthier than the previous generation, largely due to unprecedented house price inflation and threatens to live even longer. So it is hardly unreasonable that we should have to pay for increasingly expensive healthcare and social care. So, let’s be calm about the current care crisis but not just carry on. This entry was posted in Jeremy's Blog on November 24, 2016 by admin.